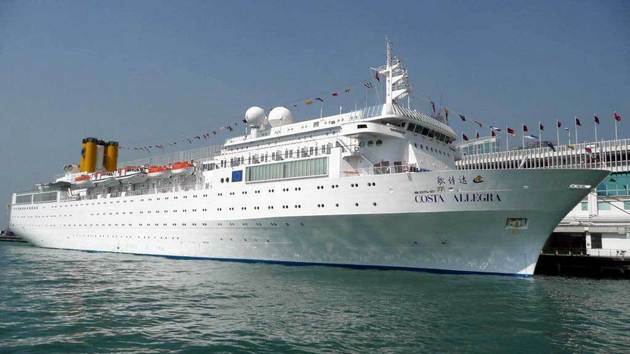 Costa Allegra, the Italian cruise ship left adrift in the Indian Ocean near Seychelles with more than 1,000 people on board following a power failure, has been taken in tow. A French fishing vessel is taking the Costa Allegra to a small island in the Seychelles, where it is expected to arrive on Wednesday. A fire in the ship’s generator room on Monday caused it to lose all power. Costa Allegra is from the same fleet as the Costa Concordia, which capsized off the Italian coast in January, killing 32. The ship is being towed to Desroches island, near Alphonse island, at the south-west end of the Seychelles. Once there the passengers will be disembarked to the one hotel on the island, and then await transfer by air to the main Seychelles island of Mahe. That process could prove lengthy, since only planes with a capacity of 20 passengers can land on Desroches. Tugs sent from Mahe were due to meet the Costa Allegra at around 09:00 GMT. The vessel has no air-conditioning or cooking facilities and an emergency generator powering the radio “could fail at any minute”, the Italian coast guard says. Earlier, Commander Cosimo Nicastro, from the Italian coast guard, confirmed that the French-registered ocean-going trawler had reached the ship. The ship’s owner, Costa Cruises, has stressed that the Allegra – which had been drifting about 32 km (20 miles) from Alphonse island – is steady and conditions are safe. No-one has been injured, officials said. Costa Cruises says it is liaising with passengers’ families via their emergency contact numbers, and has reached two-thirds of them. Contact has been made with the relatives of all the crew. Italian authorities have directed three merchant ships and another fishing vessel towards the stricken cruise ship. Authorities in the Seychelles earlier said that a plane had flown overhead and reported that the ship did not appear to be in danger. Costa Allegra is at the southern end of the seas that are vulnerable to attacks by Somali pirates. The ship sailed with nine armed guards on board, and more are stationed on the French fishing vessel. Pirates in the area have never seized a cruise ship. A government plane is also patrolling overhead. Costa Cruises said that the ship sent out a distress signal when the fire broke out, and all passengers and crew not involved in fighting the fire assembled at the muster stations. Most electric lights on board the ship are off as the batteries are being used to keep essential machinery going. A spokesman said the situation on board was calm. There are 636 passengers and 413 crew on board the Costa Allegra, which left Madagascar on Saturday. It was due to arrive in the Seychelles on Tuesday. Further destinations on its itinerary include Alexandria and Naples. A facility on Costa Cruises’ website allowing people to track the Allegra’s position says that “data transmission is temporarily suspended”. The company says the Costa Allegra received its regularly scheduled maintenance in dry dock in October 2011. The Costa Concordia ran aground off the Italian island of Giglio on 13 January. The Concordia’s captain, Francesco Schettino, has been accused of manslaughter, causing a shipwreck and abandoning ship before all those aboard were evacuated. He denies any wrongdoing.